TV Geek Army and A&E Networks Home Entertainment have teamed up to give one lucky reader the opportunity to win Farscape: The Complete Series on Blu-ray. As stated in Steve Geise's TVGA review, this science fiction series, produced by The Jim Henson Company, is about "a U.S. astronaut named John Crichton who stumbles into a wormhole during a test space flight, catapulting him into an unfamiliar galaxy populated with aliens akin to the Muppet and Star Trek schools of critter creation. Once there, Crichton falls in with a ragtag group of rebels on the run from a corrupt space police force called Peacekeepers. Crichton bonds with his new compatriots and they go on four seasons of adventures throughout the galaxy in their sentient, organic spaceship called Moya, experiencing love and loss along the way." 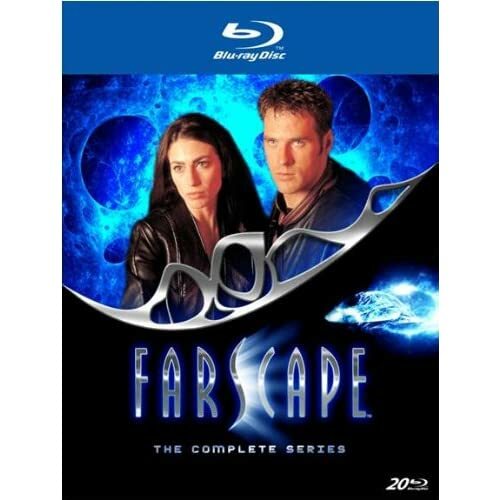 Previously available on DVD, Farscape, which aired from 1999 to 2003, is now available in high definition. “With Farscape, we work hard to meet our fans’ high expectations and this new Blu-ray release utilizes the highest quality source materials available so I know our audience will not be disappointed,” said Brian Henson, Chairman of The Jim Henson Company and executive producer of Farscape. “A+E Networks Home Entertainment has met all the challenges that, given the nature and age of the series, are inherent with a show like Farscape and the result is that all four seasons of Farscape look better than ever before.” The Complete Series on Blu-ray also includes the new documentary "Memories of Moya: An Epic Journey Explored," which includes new interviews with creators Brian Henson and Rockne O’Bannon, writer Richard Manning, and stars Ben Browder and Claudia Black. The contest is open only to residents of the Continental U.S. There are two ways to enter the contest. For your first entry, leave a comment below about your favorite moment from the series. For a second entry, "like" us on our Facebook page and leave a comment under the Farscape contest post about your favorite character from the series. As sad as it is...the intro on the final ep, Bad Timing..."Previously, on Farscape..." and hundreds of images flashing on the screen showing the wonder that is Farscape. Brilliant. For me, my favorite moment is in season three of FARSCAPE, "Green Eyed Monster". The entire episode. It's an interesting episode in that it's the first episode to be penned by series lead Ben Browder, and excellent because it manages to really focus on the characters and their relationships after the split of the crew. With no guest stars, it's almost entirely devoted to the relationship between Aeryn, John, Crais and Talyn, and as the name suggests the jealousy between the three men, vying for the attention of one woman. The characterisation is spot on for all the characters, and there are truly excellent performances from Claudia Black, Ben Browder and Lani Tupu. When you add the humorous pairing of Rygel and Stark, you have a real winner. A scene that always gets to me is when John Crichton calls his dad from the moon. Father and son, never to meet again. Tears flowing. First appearence of Scorpius. It was then that I realized everything I knew about the series was going to change. My favorite moment is when they fall to their knees kissing in Season of Death! Ayern's death scene is always one of my favorite moments of the series. Of course there are way to many for my to pick just one but this one tops my most unforgetable. By far, my favorite episode(s) is the two parter Infinite Possibilities: Daedalus Demands and Icarus Abides. It is so heart wrenching to finally see the relationship between Crichton and Aeryn, how well it works, how good they are together and then, in one moment, everything comes crashing down around them. Claudia Black's performance in the scene where Crichton dies is pure genius. Her face is so expressive that it breaks your heart to watch her lose the man she loves. Truly one of the greatest shows to ever grace the small screen and it left us far too soon. Farscape is not just the greatest Sci-Fi show, it is, and will always be my favorite show of all time. Nothing can compare to the emotional and sometimes frelling insane rollercoaster that is Farscape. Close second favorite? John Quixote. Like I said, sometimes it's frelling insane, but genius and insanity go hand in hand. When John gets Aeryn back from the Scarrans. Let's go with the coin toss at the end of the season 3 finale episode 'Dog with Two Bones. Pick one? It can't be done. I would have to pick the kiss in SOD..but then I would have to pick the ending of Family Ties..and every tag scene where we get a little character interaction. Let's go with the SOD kiss. Favorite moment is in the pilot, when John gets hold of the Peacekeeper weapon: "Don't move, or I'll fill you full of... little yellow bolts of light!" It was the moment where I "got" the show's voice and recognized it as something special and unique, and I was sold from then on. The gun from that scene was barely used in the series, but I have a replica of it in my house. Picking one moment from this phenomenal series! That's impossible! But for the sake of this contest, I'd have to go with the last episode, when the finale ends with a bang as John and Aeryn's story ends rather abruptly. I won't say specifically what happens, but it was a sucker punch!